The recent volatility in global debt markets has thrown the funding for the buyout of Chrysler into disarray. Banks have failed to find buyers of loans worth $12bn (£5.8bn) to help Cerberus Capital Management buy DaimlerChrysler's loss-making US arm. 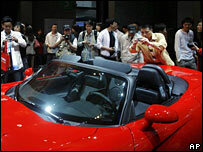 Reports say Chrysler's lenders, which include JP Morgan, will keep $10bn of the loan on their books. Fears are increasing that more expensive borrowing costs will derail the private equity-led buyout boom. DaimlerChrysler has insisted that the sale of a majority stake in Chrysler to Cerberus will go ahead, but the complications resulting from the financing of the transaction will worry markets already jittery that the end of cheap credit will have wide-reaching implications. Losses in the US sub-prime mortgage market - recently tallied to be about $100bn according to Federal Reserve Chairman Ben Bernanke - have made people more risk averse and less inclined to take on high-risk debt. The possibility of a credit crunch could also affect other big private equity-backed takeovers, which are typically funded mostly by debt. The financing of Kohlberg Kravis Roberts (KKR) management-led £11.1bn buyout of UK high street chain Alliance Boots has reportedly also been hit by the private equity firm's lenders inability to find buyers for the debt portion of the purchase. Q&A: What's weighing on the markets?